Fernanda Sanchez-Ewald, LMFT, received her M.S. in Marriage and Family Therapy from Northern Illinois University. She works with children ages 8 and up, adolescents and adults providing individual, family, and couples therapy. Her approach is strengths-based and traumainformed. She is bilingual in English and Spanish and trained in EMDR. Areas of specialization include trauma (physical/sexual/emotional abuse/domestic violence), women’s issues, family/marital conflict, and life transitions. Fernanda Sanchez-Ewald es terapeuta matrimonal y familiar con licencia para ejercer. Fernanda prefiere trabajar con niños de 8 años en adelante, adolescentes y adultos. Sus intereses clinicos inluyen trauma, depresión/ansiedad y terapia familiar y de parejas. Tiene experiencia trabajando con mujeres y niños que han pasado por situaciones de violencia domestica y abuso físico, sexual y emocional. Fernanda cree en la importancia de la relación entre terapeuta y cliente y en que cada persona que entra a su oficina tiene ciertas habilidades/areas de fortaleza que les ayudarán en su camino. Fernanda trata de siempre ofrecer un ambiente terapéutico en cual la gente se sienta bienvenida y libre de prejuicios y en donde puedan recibir el apoyo necesario para cumplir sus metas. Utiliza un enfoque de tratamiento sistémico y terapia de apego, aunque el enfoque de terapia es moldeado a lo que cada persona necesita. Fernanda está entrenada en terapia EMDR (Desensibilización y Reprocesamiento por los Movimientos Oculares), un medio que utiliza con frequecia con sus clientes. Esta terapia con base empirica es utilizada para resolver problemas causados por experiencias dificiles/traumaticas. Fernanda Sanchez-Ewald is a Licensed Marriage and Family Therapist (LMFT). She graduated with her Master’s Degree from Northern Illinois University. She is bilingual and has experience providing therapy in both English and Spanish. She is trained in Eye-Movement Desensitization and Reprocessing Therapy (EMDR) and has a passion for working with individuals who have experienced trauma. Fernanda enjoys working with children ages 8 and up, adolescents, and adults. Her clinical interests include trauma, depression/anxiety, family, and couples therapy. She is experienced in working with women and children who have experienced domestic violence, emotional, physical, and sexual abuse. Fernanda values the therapist-client relationship and believes in the strengths of every single person that walks into her office. She strives to provide a welcoming, non-judgmental environment in which her clients can feel free to be themselves and receive the support needed to reach their goals. In her work she utilizes a systemic/attachment perspective while tailoring treatment to each specific individual, family, or couple. 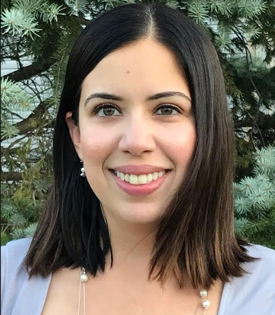 Fernanda has completed training in Eye-Movement Desensitization and Reprocessing Therapy (EMDR) and often uses this approach in her work with clients. EMDR is an evidence-based trauma treatment used to help resolve problems caused by difficult or frightening experiences.